So, how do you tackle your food budget? Do you notice that your food bill skyrockets during the summer months when the kids and their friends are home and hungry? I’ve noticed this for many years and this spring I decided to seek a little backup from my kitchen garden. Every year my small organic kitchen garden provides an array of homegrown veggies—green beans, cucumbers, potatoes, garlic, tomatoes, greens, beets and a lot more. Last May, in anticipation of my teenagers (and their friends) being around quite a bit during the summer, I decided to dedicate a little more garden real estate to zucchini. While at the garden centers, I explored my options and purchased some unique varieties such as Costata Romanesco, a striated heirloom from Italy, and Eight Ball, a round compact green zucchini. I also tossed a few seeds into the ground from some old packets and planted a couple yellow squash for good measure and bright color. Well, by July 4th, thanks to this incredibly warm and sunny weather we’ve had in Seattle, my zucchini were blowing forth and producing daily. My Costata Romanesco plant stretched more than five feet into the air and the zucchini was gorgeous and decidedly more delicious than the run of the mill varieties. All of the other zucchini plants were exploding and on July 4th I decided to start weighing the harvest and keeping track in a little spiral notebook. I wondered just what my haul would be and estimated that my initial investment in plants and seeds didn’t surpass $10. Well, much to my shock, between July 4th and July 20th, my harvest totaled 78 pounds! Yes, 78! I couldn’t believe it. When I tallied the farmers market value of that haul, a conservative estimate brought me to about $200, which I felt was a pretty solid return on my $10 investment. Obviously, zucchini held central stage in all of my cooking those weeks and indeed it became my fiscal buffer. I turned to it as the vegetable mainstay during those weeks and I used it as a good substitute for high carb alternatives such as potatoes. I sliced, shredded, baked, parboiled, steamed and sautéed it. I worked it into bread and Bundt cakes and sliced some lengthwise to mimic lasagna. I handed more than a few off to friendly neighbors and sent a few home with those teenagers who bounced in around dinner time! (I told them if they wanted the green light to go out for the evening, they had to take a zucchini home!) Most of the brood around here willingly engaged in my zucchini creations although I had one zucchini defector, William. The most athletic of the lot, my zucchini defector would make his power breakfast each morning and while sitting at the kitchen table, Will would stare at that morning’s harvest sitting before him. He would shake his head in horror and mumble how it gave him shivers. I’ve yet to convert him but I haven’t given up hope. Zucchini Brownies are on my bucket list! Grease a baking dish, slice the zucchini and layer it in the dish. Add some chopped garlic, diced tomato, herbs such as thyme and basil, season with salt and pepper to taste, drizzle with olive oil, sprinkle with Parmesan, cover with foil and bake for 30 minutes at about 375 F. Remove foil and bake for another 15 minutes or until brown and bubbly. Leftovers are great the next day. Rev up the Food Processor and Shred those Zukes! Use the shredding blade, or better yet the julienne blade if you have it. (The julienne blade, though less popular and somewhat harder to find, does produce a more elegant shred and in my opinion the julienned zucchini doesn’t get as wet and watery) Shred a bunch in advance, keep it in the fridge, and saute it, add it to quiches or gratins, or simmer it in boiling water for a few seconds, drain and toss with butter, olive oil or a sauce for gluten free pasta option. Slice It Lengthwise and Create Lasagna Sheets: With a sharp knife, slice it into long sheets, steam it and use it like lasagna or create a savory pork or vegetarian filling and wrap the steamed “lasagna” sheets around scoops of the filling. Put it in a baking dish, top with jarred marinara and bake at 350 for 40 minutes or so. Low carb, high flavor, great price! Tackle the Little Ones: If you can get them before they explode (the zucchini/not the kids), slice lengthwise and saute in olive oil and a little garlic for a quick and easy accompaniment to chicken, beef or seafood. This one only takes about five minutes and the fresh flavor is a revelation. Grill them: Slice into chunks or lengthwise, season with salt and pepper, toss in a little oil and grill over moderate heat until tender. Delicious served right away and great the next day at room temperature or reheated. This is a cool way to crank through some of the zucchini volume very quickly. 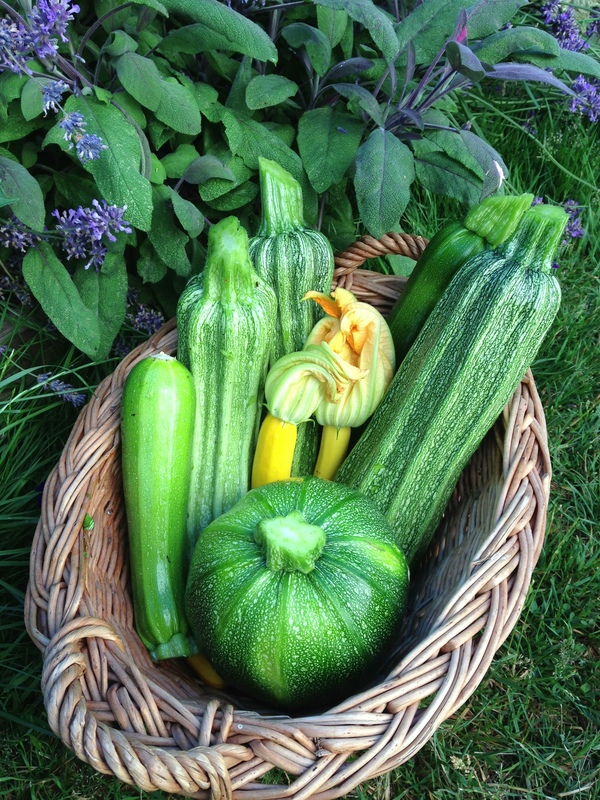 So, right now I am in a zucchini lull…my first round of plants expired and I pulled them out about a week ago. That being said…I have a second round of plants (Ronde de Nice, a French heirloom) coming up the bend…these should be producing right around September…just in time for the kids to go back to school! Previous Dungeness Crab: Take this Crabby Quiz!